Though the calendar says summer doesn’t start until June 21st this year, I’m here to tell you that it is summer in Cape May. Yes, Memorial Day was a little early this year, but it was still the official unofficial start of summer. In fact, we officially shifted to our summer dining room configuration for both breakfast and afternoon tea on the Friday of Memorial Day Weekend. It is wonderful to see the sidewalks full of happy, smiling people, many of them carrying beach chairs down to the beach. Though Cape May has wonderful “shoulder” seasons, summer is still king in Cape May. By the way, this photo is a few years old, but I couldn’t resist sharing it with you, as it is one of my favorite Cape May summer photos (I think the girl holding the shovel is really cute!). 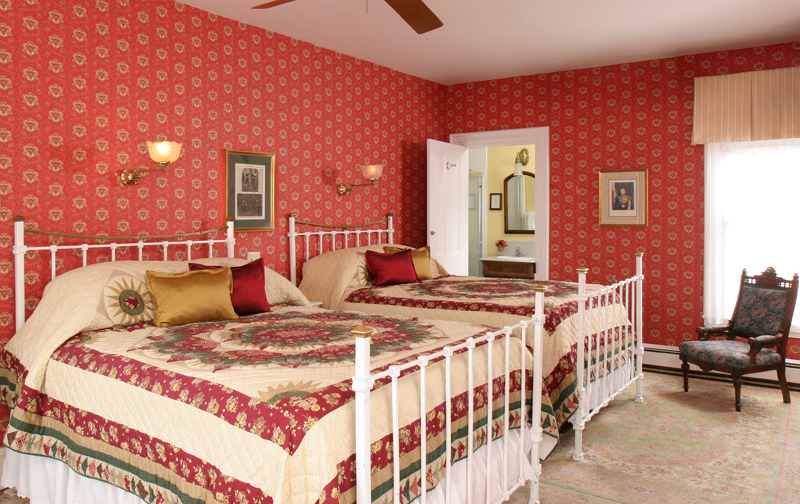 Prince Albert is one of the most popular rooms at the inn. Besides being a large, pretty room in the Queen Victoria building, it is also the only room in the inn that has 2 queen sized beds. That means that it is very popular with ladies who are traveling together. We actually refer to it as the “girl friend room”, which is a nod to the fact that it is most often rented for girlfriend getaways by friends, sisters, moms & daughters, etc. Prince Albert is also a very comfortable, bright room featuring a big bay window with 2 very comfortable new chairs, and a charming antique writing desk. For those of you who’ve stayed in Prince Albert in years past, I should tell you that we recently installed a nice wall mounted 32″ flat panel TV opposite the foot of the beds (no more straining your eyes to watch the 13″ TV on the dresser!). Because Prince Albert is so unique and popular at The Queen Victoria, it can also be difficult to reserve. It might just be time to start seriously planning that girlfriend getaway you’ve been talking about. 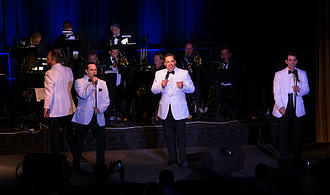 This year Cape May celebrates 26 years of great music with the Cape May Music Festival. If you love great music, then you should seriously consider planning your next trip to Cape May appropriately. Unlike most music festivals, which are big, frantic events jammed into a single weekend, the Cape May Music Festival spans 3 weeks, with a few concerts each week. 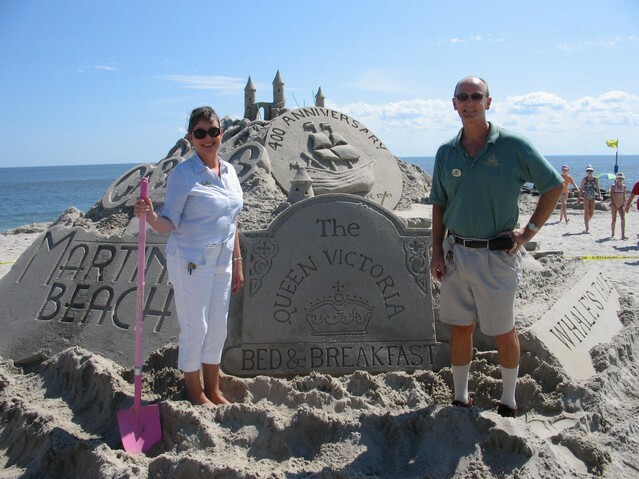 It is a leisurely affair, which fits right into Cape May’s relaxed, slower pace of life. The festival actually started on May 24th, running this year through June 11. There are daytime concerts (the Bach’s Lunch series … cute name, huh), evening concerts, and even an outdoor afternoon concert at the Physick Estate, which is a partnership with the Cape May Jazz Festival. We’ve always been proud supporters and sponsors of the music festival. This year we’re sponsoring the George Masterhazy tribute concert at Convention Hall. We’ve also given away hundreds of concert tickets to our guests over the years. As always, we’ll be happy to give you complimentary tickets to one of the concerts with any 2 night reservation (excludes the “Jazz at the Estate” concert and Bach’s Lunches). Be sure to ask for them when you call to make your reservation! This interesting looking assemblage of Gingerbread is actually a structure designed to hide our new generator. While I’m pretty excited about having a fancy new generator, I didn’t think it was something that you were going to get too excited about. But … we’ve built into this structure something that I think you might find as interesting and lovely as I do. Across the front face of the enclosure, we’ve installed a removable Beverage Bar that we crafted from some beautiful Mahogany. This is MUCH more charming than the plastic folding table we put into use last year! The stain and finish we applied to the bar really brings out the beautiful grains of this wonderful wood. Be sure to check it out when you are here. You can’t see it very clearly in this photo, but the supports for the bar, also made in our shop from mahogany, are beautifully carved to match the corbels that support the porch roof of Prince Albert Hall. During our breakfasts this summer you’ll find our beverage bar filled with coffee urns, an urn of hot water for tea, and juices … everything to satisfy your breakfast thirst. One of the best times to visit Cape May must surely be our annual Restaurant Week, which always occurs at the beginning of June. Cape May is known for its great dining. In fact, Cape May was recently named one of the Top 20 food cities in the United States by Conde Nast Traveler magazine. 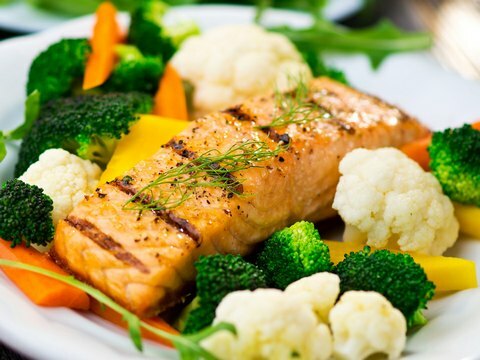 Restaurant week is a great opportunity to try out some of our best restaurants at great discount prices. All week long over 20 local restaurants will be serving up their finest dishes at a great discount. Three course dinners at both the $25 and $35 level, as well as two course lunch offerings for $15 can be found all over town. Anna Marie and I always look forward to Restaurant Week, and this year is no exception. Unfortunately, since most of our favorite restaurants are participating and we don’t have enough nights to enjoy them all, we’re going to have to make some tough decisions. Life is hard some times. Father’s Day is fast approaching, and I’m willing to bet that you are having a hard time figuring out how to honor your father for all that he has done for you over the years. Here is the truth about Dads. They don’t like to be fussed over, they don’t really need any more “stuff”, and they are HARD to shop for. Deep down, though, even the toughest, manliest Dad loves to be recognized and will happily accept a wonderful gift from his kids, especially if he can share it with his lovely lady. So what is the only perfect gift for your Dad this year? A gift certificate to The Queen Victoria, of course. It meets all the criteria and he is sure to love it. It is also easy to buy. 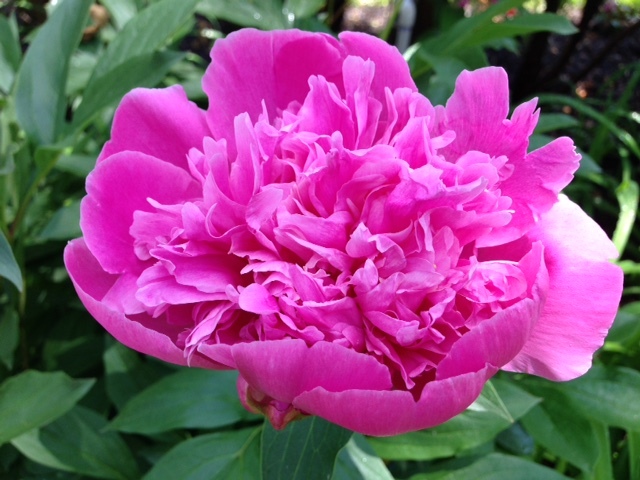 This lovely bloom can be found in our beautiful perennial garden at the Queen’s Cottage. This garden has been blooming since February, and our latest blooms are these lovely Peonies, which started blooming this week. Unfortunately, I can’t share the wonderful fragrance that this beauty is giving off. If you’re planning a visit to The Queen Victoria in the next month or so, be sure to check out this beautiful garden and see what delights await you! One of the most important characteristics of any great vacation purchase is its ability to remind you of your vacation after it is over. In fact, it may be the very most important thing. 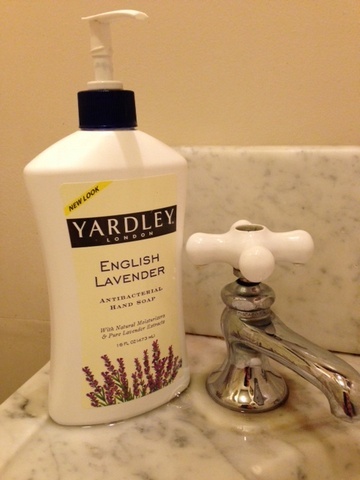 That would make our Yardley hand soap one of the best possible gift shop purchases possible inThe Queen Victoria gift shop. That wonderful lavender fragrance is guaranteed to bring you back to Cape May every time you use it. I know that every time I wash my hands (yes, Anna Marie and I have it at every sink in our home) I am reminded of the day we purchased The Queen Victoria, which is over 11 years ago. Scent memories are amazing things! Be sure to purchase one or two bottles for yourself on your next visit. I promise you will be transported for a few moments back to our little slice of paradise. Even if you are not an avid bike rider, or haven’t ridden a bike in years, bicycling through Cape May is still a great option for you. Some people view a bicycle as a means of transportation. It is much more than that, if you think about it. Sure, it is probably the most efficient way to get around Cape May, especially during the busy Summer months. It is also a fun, carefree way to explore Cape May, see the sights, and just enjoy the thrill of the wind blowing through your hair in the process. Some of my earliest childhood memories involve my bicycle, and jumping on one of our bikes, even for a quick trip to the hardware store is always a bit of a thrill. 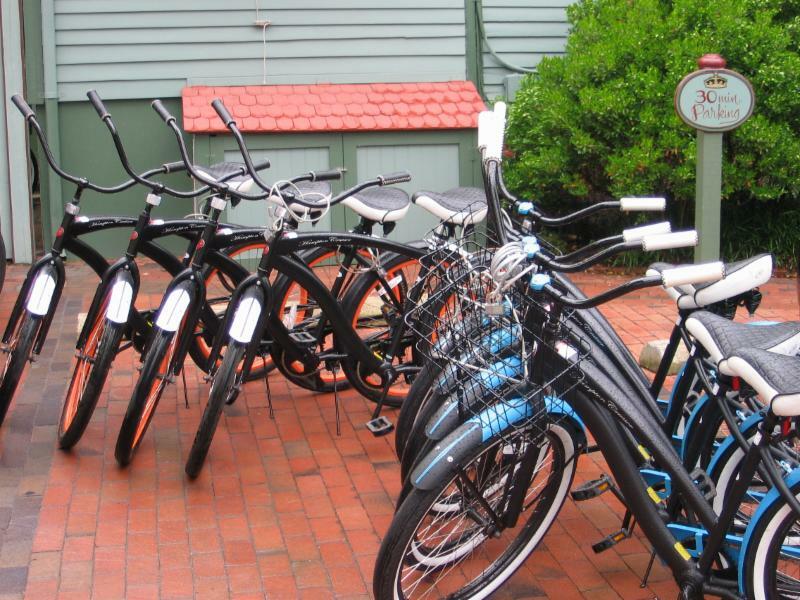 We have a “fleet” of 16 beach cruiser bicycles that are available for you to enjoy. In fact, we’ll be upgrading our fleet this spring, so our bikes will be brand new. They have adjustable seats, a single gear, and coaster (foot) brakes, so they couldn’t be easier to ride. 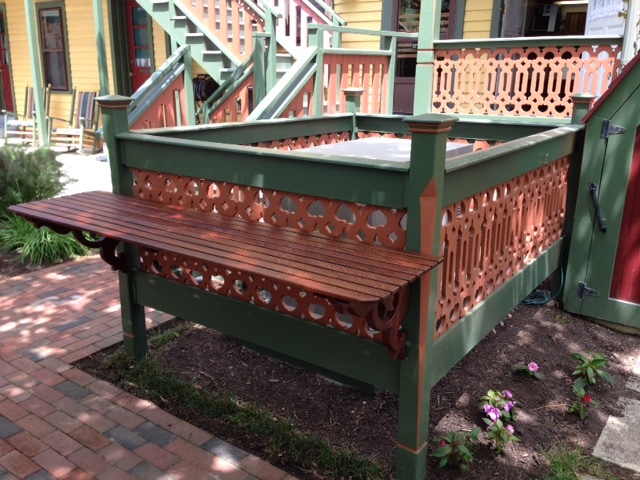 Hint: There is a bicycle tour that you can purchase at the MAC ticket booth, which provides descriptions and photos of over 50 Cape May historic properties and landmarks, along with a map. At $5, it is a great deal. There is something about lighthouses that is very compelling for many of us. I know that I’ve always been intrigued and attracted to lighthouses. Visitors to Cape May are lucky to have the opportunity to not only get “close up and personal” to a beautiful lighthouse, but even go inside to the top! Beyond the thrill of ascending one of these iconic structures and experiencing the wonderful view of Cape May Point, the lighthouse offers a glimpse into our history and maritime past. It is also a fascinating example of applied engineering and craftsmanship. The lighthouse is a short drive or bike ride of about 3.5 miles (it is my favorite bike riding destination). It is about a 2 mile walk from the inn, halfway on the promenade, the other half on the beach. It is located in Cape May Point State park, which also features plenty of parking, picnic areas, beautiful walking trails, a beautiful (unprotected/non-swimming … and free) beach. The lighthouse is open daily for tours and also features a gift shop located in the original “oil house”, where you can purchase your favorite lighthouse souvenirs. The Merion Inn is certainly a Cape May Classic. It has always been a favorite of ours. 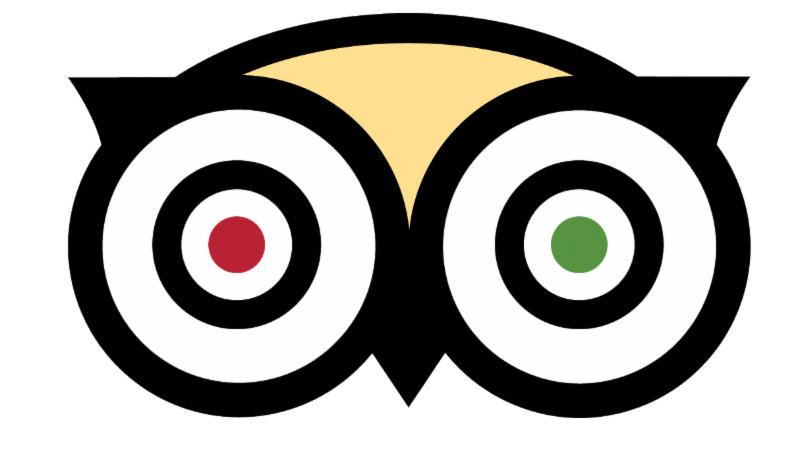 What do you look for in a great restaurant? 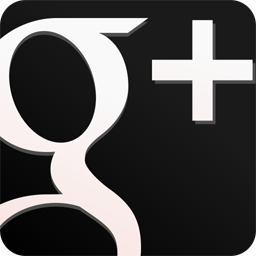 For us it is great food, a charming atmosphere, and great service. The Merion Inn delivers in every way. As soon as you walk in the door into the beautiful bar, greeted by live piano music, you’ll know you are in a special place. The decor is very charming, with seating arranged in several intimate dining rooms. We love the food. You’ll find the menu to be large, but not overwhelming, with several special sections that are very interesting. Anna Marie especially loves the “No Frills Seafood” section of the menu, which features several different fish, prepared simply in whatever way you want (pan seared, broiled, hand-breaded and deep fried, or blackened), without a lot of sauces and extras. I’m particularly partial to the Flounder Franchese, which I think is the best on the planet (especially with the marinated artichoke hearts available upon request). In fact, it has been a long time since I ordered anything else. Though we don’t usually make it as far as dessert at the Merion Inn, I highly recommend the “chocolate pots de creme with whipped cream”, or the Key Lime Pie, or the the “fallen chocolate souffle with white chocolate mousse and raspberry puree” or …. OK, I guess we make it to dessert more often than I initially admitted. Sadly, the Merion Inn is not a BYOB, but they have a nice wine list, with bottles of wine for as little as $20. My own favorite is the J. Lohr Cabernet, which at $35 is a real value for a restaurant.